I recently posted on Obama’s Diversity Executive Order and said Diversity = Social Justice. I mused that perhaps the EO, calling for more diversity in federal hiring, was actually Obama’s jobs plan. Perhaps there is more to it than that, as a commenter pointed out at Gulag Bound, where my article was cross-posted. The commenter picked-up on the word ‘diversity’ and ‘council.’ The EO calls for yet another presidential ‘council,’ which in Russian means ‘soviet.’ Gulag Bound is a site that focuses on Marxism and Communism and sounds the warning bell each and every day. The commenter took them to task for my article, and for not recognizing a bigger picture. To be clear, the writers at Gulag Bound miss nothing. Below the comment you’ll find a list of Gulag Bound’s previous articles on the very subject the commenter mentions. The article at Gulag Bound and the comment are here. Come on Guys, don’t you claim to understand Marxism? A diverse group of people dialoguing to consensus over social issues in a facilitated meeting is a soviet council form of government!!!!! The Hegelian-Dialectic Consensus process cannot work without the element of diversity. The process must have diversity. ATTENTION, ATTENTION: The process must have D-I-V-E-R-S-I-T-Y!!!!!!!! Diversity is key to the Consnesus process: The process which facilitates abandoning principle or thesis or position for the sake of relationship. It is critical to facilitating paradigm shift or moving the people in the direction that social engineers want them to go. Historically a watchman or guard would defend position even if it cost him his life. The Consensus process is akin to breaching defended borders by tricking the watchman into giving up position. It also conveniently serves to shut down free speech or organize opposition creating a secret police type of atmosphere. Obama has created an overtly treasonous Executive Order and a whole nation stands clueless. The idea of the ‘council’ or ‘super committee’ or Gang of 12, or Gang of 6 or whatever, is just as you see expressed above. We know that nothing good comes of these Congressional and Administrative groups. Important issues get clouded, downgraded, dulled, nulled and eventually lost in consensus. We end up with nothing principled. 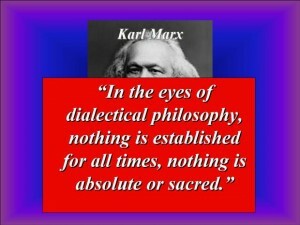 The concept of the dialectic has been around for a long time. It is simply that of opposite positions: Thesis (position) vs. Antithesis (opposite position). In traditional logic, if my thesis was true, then all other positions were by definition untrue. For example, if my thesis is 2+2=4, then all other answers (antithesis) are false. George W.F. Hegel, the nineteenth century German philosopher, turned that concept upside down by equalizing Thesis and Antithesis. All things are now relative. There is no such thing as absolute truth to be found anywhere. Instead, “truth” is found in Synthesis, a compromise of Thesis and Antithesis. This is the heart and soul of the consensus process. This is diametrically opposed to the Judeo-Christian world-view prevalent in the Western world for the better part of two millennia that held that God existed, that He existed outside of the material creation and that man had a moral obligation to Him and His laws. God was transcendent and thus truth was absolute and transcendent, outside of our ability to manipulate it. This all changed with Hegel and modern man was born. Man could now challenge any authority and position, even God. Since there is no such thing as absolute truth, “my truth” is just as good as “your truth,” so don’t tell me what to think or how to behave. As Nietzsche, the “God is Dead” philosopher, would later say, “There is absolutely no absolute.” Read more at News With Views.